iBooks likes to keep books listed, even after you've deleted them. A reader wonders if that can be changed. Tony Leneis would like to keep some of the books he’s purchased from Apple from appearing in iBooks. I have Apple’s manuals for iPhones, iPads, and iPods for iOS 6, 7, and 8. 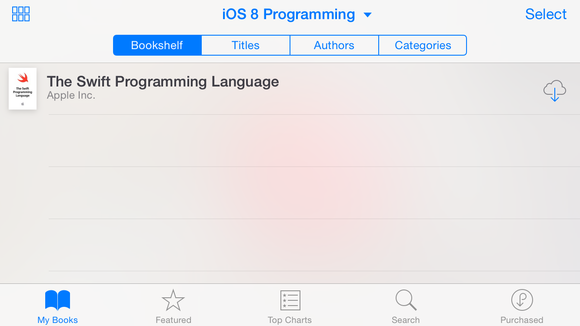 At this point I only want the iOS 8 manuals, but while I can delete the book files from my devices, they still are listed on my bookshelf as downloadable from the cloud. What makes this particular maddening is the titles for many of the aforementioned books are too long to view in iBooks, so the only way to find the iOS 8 version for iPhone is to download and open each iPhone manual until I find the right one. The bad news: Once you obtain a book from Apple, it’s forever in your iCloud account. It will follow you to the end of time, like a cloudy spectre of words. The good news: While it remains in your account, you don’t have to see it! And you’ve got two ways to work around it. While you can’t delete purchases, you can hide them, although you have to use iBooks for OS X to do so. You can hide your purchases so they don’t appear in iBooks, but only in OS X.
Click the iBooks Store button, and log in if prompted. Click the Purchased link on the main store page (at middle right). Hover over a purchased book and click the X in its upper left. You’re prompted to confirm hiding the book. Click OK. It can be unhidden via Account Information as noted. You can also organize books to keep them available but out of the way. In iBooks for OS X, use the List view, which lets you resize columns, and see the full name of lengthily titled books to identify them more easily. Make sure syncing is enabled between iBooks in OS X and iOS. You should be be prompted to turn sync on when logged into an iCloud account when launching iBooks in OS X. 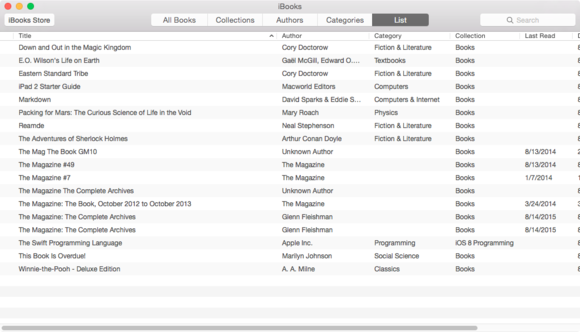 The iBooks list view in OS X lets you extend the book’s title field to see lengthy names. If you don’t have iBooks installed in OS X, use the landscape view on an iPhone or iPad in iBooks, as it will use the full width of the screen to show the title. Now create collections corresponding to your needs. In your case, you might want “iOS 8” as one collection and “Outdated manuals” as another. Now you can move titles into those collections. 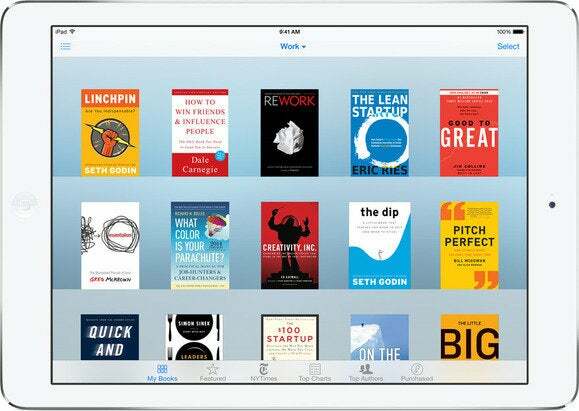 iBooks lets you shelf books into collections. In OS X in the List view, right-click a title and then select Add to Collection. You can also select multiple books and choose New Collection from Selection if you’d prefer to go that route. If you want to organize visually, click the Collections button then select the All collection link at left. Now you can drag books into collection names below All and they’re added to those categories. In any view, click Select. Tap the circle next to any book you want to put into a collection. Tap Move at upper left. In the Collections list, choose the category you want or swipe to the bottom to choose New Collection. Creating a collection is an easy way to make sure you can quickly find what you want to read or download from iCloud. You can also suppress the display of books stored in the cloud and not present locally. In OS X, chose View > Hide iCloud Books. In iOS, tap the collections select at the top of iBooks, then tap Hide iCloud Books’ switch to on (green).